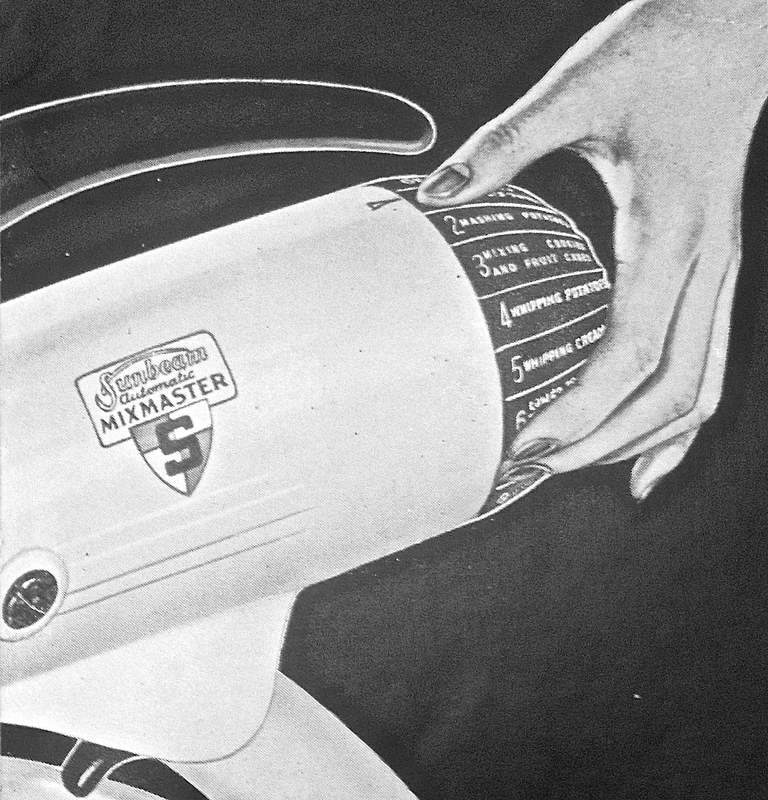 My newlywed mother took her mother’s advice along with a wedding gift from my uncles and aunts– the hottest, do-it-all appliance of the day– the Sunbeam Mixmaster. In time, she would set up a tasteful pink and gray formica kitchen with a chubby Frigidaire and a pushbutton GE stove to complete the suite of modern appliances. Her Mixmaster model was the Cadillac version, complete with all the bells and whistles. Unfortunately, its bells hardly ever rang, and its whistles rarely blew. 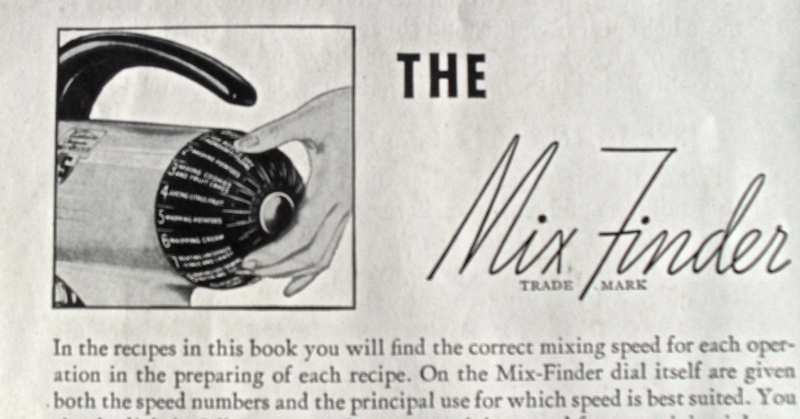 “You now have the finest mixer ever made,” said the manual written by the Sunbeam Home Economics department. The accompanying booklet welcomed home cooks to their “family of nearly five million homemakers” who now were, as owners of this extravagant but necessary device, “saving time and arm-work, and enjoying more delicious foods.” Claims that “the more you use it the more helpful it will become” would fall flat in my mother’s kitchen. In those days, my mom’s cooking repertoire was limited. “I was a creative cook,” she asserts today, decades after her Sunbeam Mixmaster was shoved into the back of a cupboard, first in her home and now in mine. Her efforts in the kitchen consisted mostly of timid experimentation and moderate success with various jello “salads” and “molds”; however, her one claim to fame among the Wayne Avenue mah jongg-ers was her Orange Chiffon Cake. And the Sunbeam Mixmaster was the reason why. With over fourteen pages in the owner’s guide dedicated to multiple attachments, the booklet reads like a plumber’s manual with illustrations of couplings, joints, screws, and washers. An auxiliary motor drives a meat grinder, food chopper, can opener; a potato peeler, juicer, drink mixer, a knife sharpener, and– I kid you not– a silver polisher and buffer. And did I forget the butter churner, bean slicer, and huller for peas? The homemaker of the 1950’s obviously had lots of time on her hands to use her time-saving appliances. A miniature hardware store, this entire collection of geegaws constituted an enormous amount of crap that took up space and was just more mechanical stuff to break. 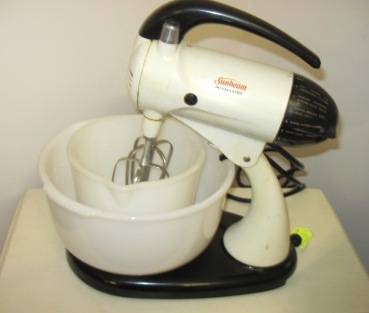 But it was this cumbersome electric mixer which built my mother’s confidence as a baker. While everyone else’s version of chiffon cake was, according to my mom, wet on the bottom and weeping citrus goo as it collapsed upon slicing, hers remained tight, firm, and dry. ( Dry? That was good? ) It was the one thing that came out well in her Mixmaster, she said. 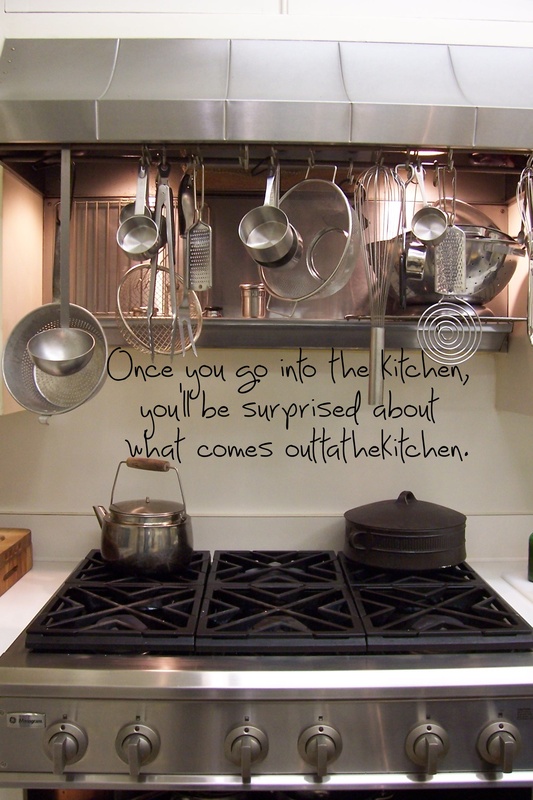 My mother most certainly never read the first cardinal rule of the Mixmaster manual on page four: “Do not overbeat.” Since “more is better” was always one of her key cooking principles, the secret to her “success” was clear. If the recipe called for beating eggs whites for 5 minutes, Rheta, I can assure you, with the help of her fancy Sputnik era machine, beat them longer– well past the glossy-and-stiff stage into the dry-but-not-separated realm. Then, with her over-folding and over-baking, the fate of the cake was sealed. Her orange juice laced chiffon cake may have been springy and held its form, but the women in her mah jongg club were more than likely enjoying a tasteless and arid confection which induced immediate thirst. Today, Rheta has become a much more sophisticated and skilled cook than she ever was as a mother and housewife, and I am proud of her knowledge and interest in good food. But she still has no use for an electric mixer. At best, she was more of a social baker who took her turn baking for activities at the synagogue, and I do remember enjoying a good many boxed cakes she beat to death in that mixmaster in honor of each of our birthdays. I have no memory of ever eating her Orange Chiffon cake. Rheta’s Mixmaster just celebrated its 64th birthday last week. I take it out from the bowels of my lower cupboards occasionally for a test drive and just for nostalgic reasons. The smell of the overheating electric motor and bakelite finish are both a memory of my youth and a clear indication that the mixer could use a good overhaul and oil change. In my childhood, I was not allowed to ever use the mixer. I did sneak using it once to make brownies for my Girl Scout troop and ended up with globs of chocolate batter dotting the kitchen cupboards and ceiling. The strenuous clean up and panic of being found out pretty much cured me of my fascination with the mighty mixer. To this day, I prefer whisks, stainless steel bowls, and wooden spoons. Happy 64th Birthday to my mother’s Sunbeam Mixmaster! 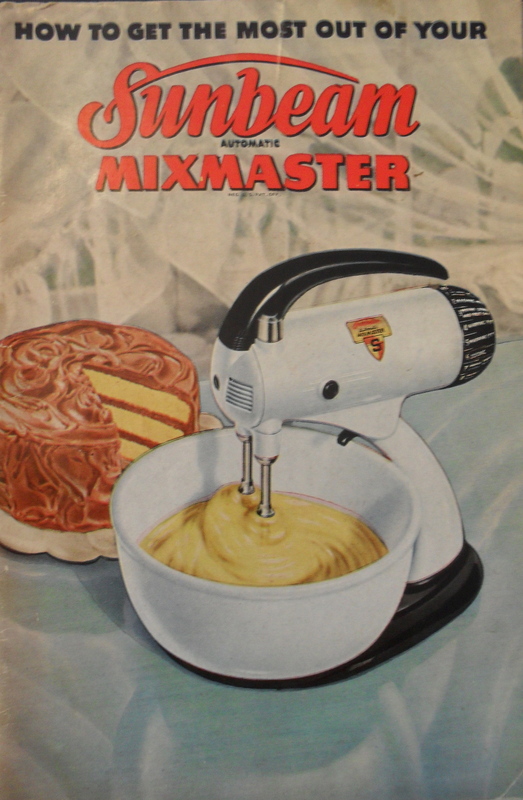 The Good Housekeeping Institute boasted in the Mixmaster manual that “…you can’t overwork the Automatic Mixmaster.” My mother took to heart the advice of the Sunbeam company in her one and only baking achievement. The following recipe is from about 1956. 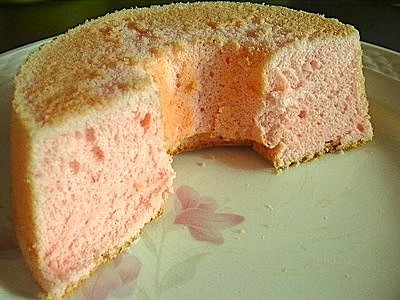 While chiffon cakes first appeared in the late 20’s, they became all the rage in the 50’s. Recipes were passed around, and that’s where my mother got her recipe. 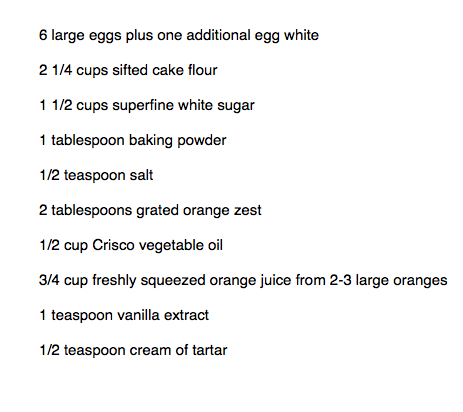 The key to a successful chiffon cake is properly beaten egg whites and a correct ratio of liquid to dry ingredients. Baking in an aluminum tube pan in an even baking oven is also going to give the best result. –Separate the yolks form the whites while the eggs are still cold. –Cover each bowl of yolks and whites with plastic wrap and bring to room temperature (about 30 minutes). PREHEAT OVEN to 325º and PREPARE PAN, a 10” tube pan UNGREASED. –place flour, sugar minus 1/4 cup, baking powder, salt, and orange zest and combine. –Create a well in the center of the flour mixture and add the egg yolks, oil, orange juice, and vanilla extract and beat until smooth (about a minute). Scrape the sides of the bowl during beating. –Beat the egg whites until foamy. Then add the cream of tartar. –Continue beating until soft peaks form. –Beat in, gradually, the remaining 1/4 cup of sugar, until STIFF PEAKS form. (You should be able to invert the mixing bowl and the egg whites will not slip out). –Then FOLD the beaten egg whites into the first batter gently using a LARGE RUBBER SPATULA. Fold until just blended. Avoid deflating the batter. –Lightly drop the filled pan onto the counter to release air bubbles..
–Bake for 55 to 60 minutes, or until knife or toothpick inserted comes out clean.The cake should spring back upon light compression. –Remove cake from oven and cool UPSIDE DOWN. (You can suspend the pan on a bottle). –Cake must COOL COMPLETELY before removing it from pan (1-1/2 hours). After removing the cake from the pan using a spatula run along the edges, set it on a rack and dust with confectioner’s sugar or drizzle an orange flavored glaze on top. Serve with ice cream or whipped cream. My mom’s white mixer got replaced by a green one in the ’70’s to match her new kitchen renovation. She was also a fan of “more is more” I’m looking forward to trying the cake recipe, I’ll have to drag out the monster KitchenAid if beating egg whites is involved. I got it at a local thrift store for $20 because it was the unfashionable Avocado green from long ago, I love it because it reminds me of my mother. I haven’t had chickens for at least 5 years now, but I lament the quality of store bought eggs every day. I’m waiting for the farmer’s market to start up in the spring to get proper eggs. Great mom/mixer story. That green thrift store mixer was calling to you. What a bargain! Let us know how the cake turns out. OTK would love photos of your chiffon. And I hope your store bought eggs do the trick. I suggest using X-tra Large grade. Speaking of old appliances, the last time I was in Forest Hills Auntie Barbara asked me if I knew a way to fix her 50-year-old Revere (that’s pronounced Revee-ah) kettle which sprang a leak at the same between the copper bottom and the side. I just gaped at her, like, Seriously? You really don’t want to just buy a new kettle? I ended up finding the customer service phone number for Revere (which brand was bought by some cooking conglomerate a long time ago) so she could call and ask them. By the way, I’m doing a massive archiving project going through all of Uncle Larry’s Kodachrome slides dating back to 1957, and there are one or two in there of you and Gareth when you were little, extremely adorable, and a couple of Uncle Joe too. I’ll send them to you when they’ve been converted to digital. Cousin Gershon. You are peach. Keep the food and family memories coming. Very funny reminiscence. I will always remember the colored rainbow lights on our pushbutton stove. I miss them! You have a solid ‘proper’ Mixmaster mixer there, why would you want anything else ? Did you get the pencil-sharpener attachment with yours 😉 ? 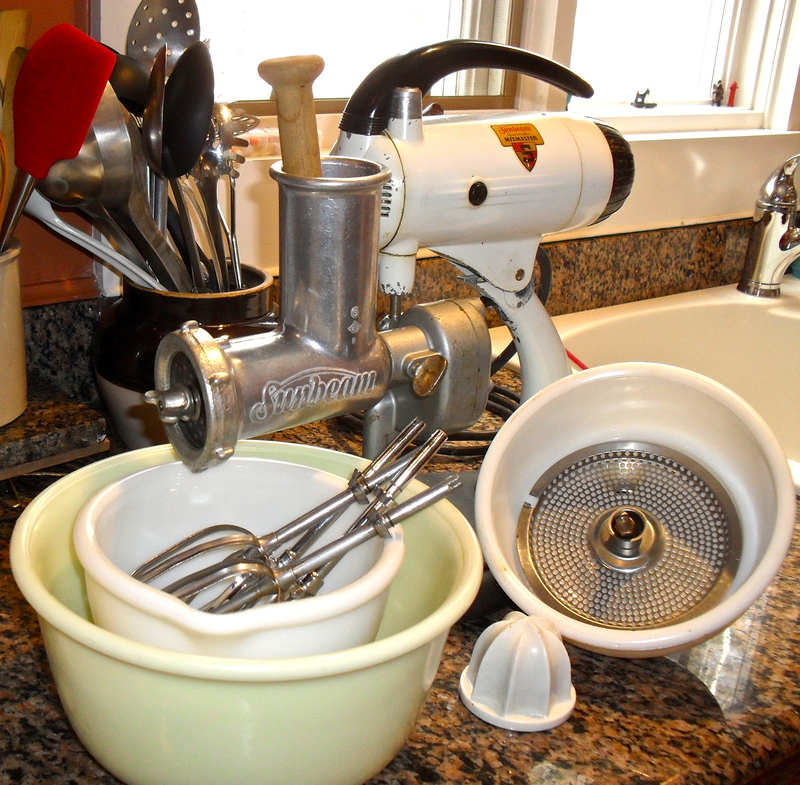 My mother owned her 1950s Mixmaster for close to 50 years. She won the Betty Crocker junior baking contest at ag 12. She was an amazing Baker. Growing up she had fresh cakes and baked goods dairy! When she was 70 her mixer died. I kept the bowls. A year after she passed away in 2012 I purchased a vintage Mixmaster just like hers and the one I learned to cook with. I sold my kitchen aid. I have been making amazing moden cakes since then…for events and special parties. The cakes I bake turn out moist..and delicious. I use it almost daily. With any piece of equipment you have to understand the principles of baking. Usually it’s the fault of the baker not the equipment. I inherited my grandmother’s Post WW2 Sunbeam mixmaster after my last bachelor uncle died at 99yrs. It hasn’t been used since my grandmother died in 1960. I’ve never had a stand mixer before, only hand held. I love it but I’ve started making bread since our 100 year old bakery closed its doors last summer. I thought it was from the 1940s but it looks just like the one in your pic. It doesn’t have a dough hook. Did they have those kind of attachments for these vintage models. Thanks for this family story. I love that you inherited the mixer over 50 years later and have started using it. As for the dough hook, my mother’s 1949 model did not have them among her collection of attachments, but I have seen them for some vintage models– they look like two cork screws. If you can find the model number of your mixmaster, I am sure you could get the dough hook attachments on ebay or another vintage kitchen outfitter. These mixers were certainly built to last! NOTE: I do have a Kitchen Aid stand mixer now, though I did not when I wrote the article. And I, too, have been baking bread (from sourdough starter these days). Here’s to continued enjoyment from your special family heirloom.